National Get Out of the Doghouse Day is a day for apologies and sweet words to get yourself out of the doghouse. Maybe you forgot to clean the dishes one night, much to the chagrin of your spouse. Perhaps you accidentally burned a hole in your partner’s favorite shirt. No matter your crime, this is a day for forgiveness and setting things right with your loved one. Words are a good way to start your apology, but a tangible token of love will help your case. Consider the following delightful items from 1-800-Flowers to help show your true feelings. 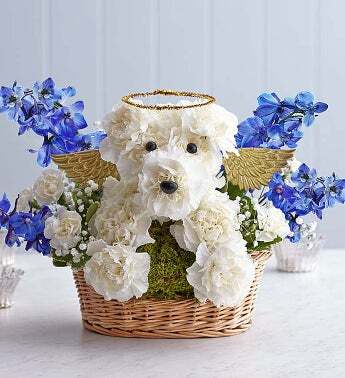 The original a-Dog-able flower basket is a classic favorite. This adorable dog, made of white carnations, smiles from her reusable basket. With a bow on her head and a cute nose, this sweet dog will tease out a smile from your aggrieved loved one. The many bright blooms around the carnation dog include poms, asters, statice and more. This basket is a fantastic way to express your heartfelt desire to leave the doghouse. If your loved one has a soft spot for treats, consider the Fields of Europe™ Romance™. This delightful sampler hits all the right notes with a bouquet of gorgeous flowers, a box of chocolates and a cute plush dog. This lovely pink and red bouquet contains Gerbera daisies and other assorted flowers and plants. The black and white plush dog holds a small red heart, showing your feelings, and the eight ounce box of chocolates offers a wide range of gourmet tastes perfect for chocolate lovers. If your loved one is a “wino” then a wine gift may be the perfect idea! along with their favorite snacks makes the perfect wine gift basket. You can make your own wine gift basket by adding his or her favorite wine along with their favorite snacks, or you can buy a wine gift basket to deliver right to their front door. In the spirit of the holiday, put some extra effort into your gift’s presentation. Don’t simply place your gift on a table for your partner to find. Use one of the following ideas for a creative apology. Craft your own cardboard doghouse. First, locate a box large enough to cover the gift. Cut a half-oval shape into one side of the box. If you’re feeling creative, embellish the box with a fancy paint job and decorative touches. When you’re done, simply cover the gift with its new home, and leave it somewhere for your loved one to find. Don’t forget to include a note of apology. With a heartfelt note and a little gift, we’re sure you’ll be out of the doghouse in no time, afterall, it’s National Get Out of the Doghouse Day – you’re not alone.